Fact: curious kiddos will put almost anything in their mouths — which makes playtime with teething tots a dubious experience. And when it comes to creating masterpieces, art tools often end up as chew toys which get confiscated from frustrated wee ones who just want to have fun. So when we learned about Wee Can Too‘s edible chalk, we had to take note! 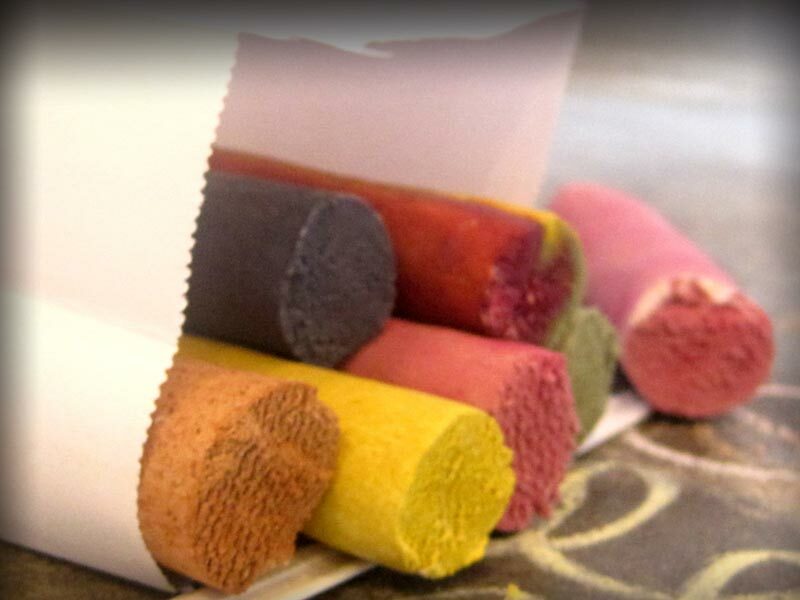 Conceptualized and crafted by a mom and artist, this lead-free sidewalk chalk is made with totally vegan, organic food based ingredients including beets, spinach and blueberries. It contains no wheat, sugar or preservatives. Available in a set of five colors: green, yellow, orange, pink and purple, the folks at Wee Can Too Art advise, “the term ‘edible’ means safe and nutritious, made completely from food based ingredients, and the ingredients are organic and good for your children in case they decide to taste or explore with their mouths. However, the art supplies are not food and should not be used for consumption.” So just be sure to pack a real snack when you hit the pavement! Fact: curious kiddos will put almost anything in their mouths -- which makes playtime with teething tots a dubious experience. And when it comes to creating masterpieces, art tools often end up as chew toys which get confiscated from frustrated wee ones who just want to have fun. So when we learned about Wee Can Too's edible chalk, we had to take note! Conceptualized and crafted by a mom and artist, this lead-free sidewalk chalk is made with totally vegan, organic food based ingredients including beets, spinach and blueberries. It contains no wheat, sugar or preservatives. Available in a set of five colors: green, yellow, orange, pink and purple, the folks at Wee Can Too Art advise, "the term 'edible' means safe and nutritious, made completely from food based ingredients, and the ingredients are organic and good for your children in case they decide to taste or explore with their mouths. However, the art supplies are not food and should not be used for consumption." So just be sure to pack a real snack when you hit the pavement!